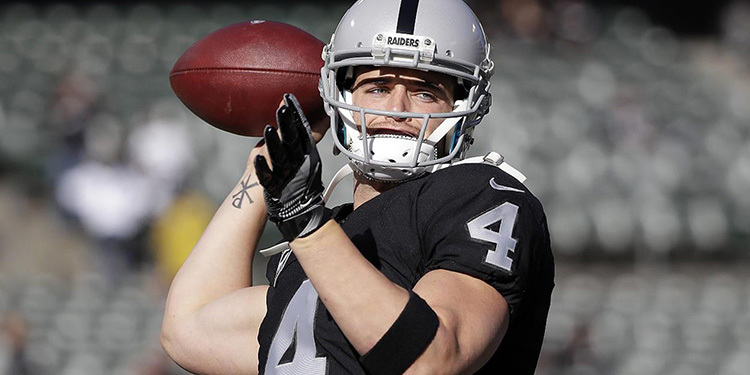 Mark's Tickets is the best place to find tickets for Oakland Raiders fans. Just check this page for any new events or schedule updates throughout the year. We sell tickets to every Oakland Raiders game around the world. We know how passionate Oakland Raiders fans can be about football, so we make sure to have hundreds of tickets for every game available right up until it starts. For those looking for cheap Oakland Raiders tickets, we offer tickets starting at very low prices (many times below face value). We offer tickets in most sections of every venue that you can see Oakland Raiders. Simply choose the city or venue that you are interested in below, and you will be able to see all of the available seats. Do not forget that Marks Tickets also specializes in sold out Oakland Raiders tickets. No longer will sold out shows prevent you from seeing Oakland Raiders. The Oakland Raiders are a professional football team that plays in the NFL. The Raiders play their home games at O.co Coliseum in Oakland, California. With 16 games per year, and 8 being home games, The Oakland Raiders are a professional American Football team based in Oakland, California. They were founded in 1960. For the first ten seasons of their existence, the Raiders belonged to the American Football League; they have been members of the National Football League since the 1970 AFL–NFL merger. As of 2013, the Raiders belong to the Western Division of the American Football Conference. Over fifty-two seasons of football, the Raiders have experienced a considerable amount of success. Entering the 2013 season the Raiders sported a lifetime record of 430-363-11 (winning 54% of games played), with a playoff record of 25-18. In the club's first three seasons (1960-1962), the team struggled both on and off the field. In 1963, the Raiders appointed eventual owner/general manager Al Davis to the position of head coach. Under Davis' guidance, the team's fortunes improved dramatically. In 1967, the Raiders reached the postseason for the first time; they went on to win their first, and only, AFL title that year by beating the Houston Oilers in the Championship Game, but they were defeated by the Green Bay Packers in Super Bowl II. The Raiders' run of success intensified in the 1970s; during this time, they won six division titles and played in six AFC championship games. In 1976, the team captured its first championship by defeating the Minnesota Vikings in Super Bowl XI. In 1980, the Raiders unexpectedly won a second championship by defeating the Philadelphia Eagles in Super Bowl XV. Two years later, the franchise relocated to Los Angeles. In 1983 (their second season since the move), they defeated the Washington Redskins in Super Bowl XVIII to capture a third championship. The Raiders' fortunes declined considerably following the 1985 season; they would win just one division title (1990) and two playoff games over their final nine seasons in Los Angeles. In 1995, the team returned to Oakland. In the early 2000s, the Raiders experienced a massive (albeit brief) resurgence; their renaissance culminated in a 2002 loss to the Tampa Bay Buccaneers in Super Bowl XXXVII. The team struggled significantly in the years following the Super Bowl loss. While the Raiders' fortunes somewhat improved in 2010 and 2011, they have not reached the playoffs (or attained a winning record) in 10 seasons. They most recently finished 4-12 in 2012. Today, the Raiders are known for their extensive fan base and distinctive team culture. Since 1960, the team has won fifteen division titles (three AFL and twelve NFL), three Super Bowls, four AFC titles (1976, 1980, 1983, and 2002) and an AFL Championship. Thirteen former members of the team have been enshrined in the Pro Football Hall of Fame.